Seeing is Believing This sample manual to teach Office 2010 is in MS Word format. Office 2010 applications provide you with the tools you need to make your organizational processes more efficient, more modern, and more successful. Your students need to know exactly how to use these tools in order to maximum the results. In this popular training materials Bundle, you receive everything you need to teach Office 2010. Our training materials have been professionally designed to ensure your students are learning the most important aspects of the software. Incorporating new technologies into your workplace can be difficult if personnel are resistant to change. 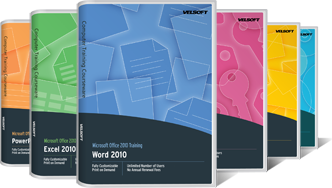 Our training materials for Office 2010 offer new students basic information, while our intermediate training materials carry them through their learning process. We believe our training materials for Office 2010 are appropriate for all students learning to use the program. Our writers have developed a step-by-step agenda to easily navigate through the courses. Students will be able to build a solid knowledge foundation, while continuing to learn the more challenging aspects of the program. The success of your organization is directly dependent on the continued investment in your employees and staff. Their training will only be successful if they have been given the appropriate instruction to meet their needs. Our training materials for Office 2010 are fully customizable; meaning you can adjust the course content to meet the unique experiences and needs of your students. We offer quality, affordability, and excellent customer service. Our Bundle for Office 2010 is a fiscally responsible way to fulfill the goals of your training and employee development plan.